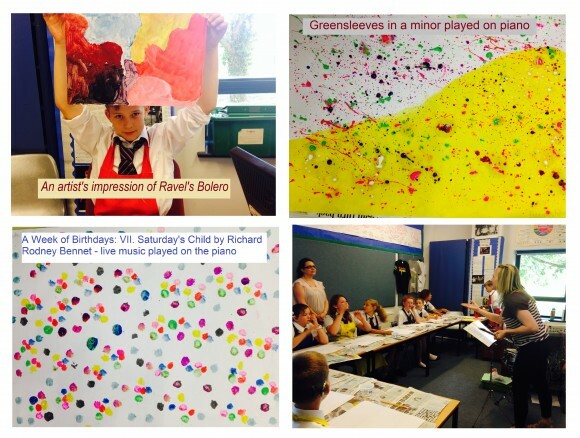 This sizzling summer term saw me leading workshops in Berkshire for Decibels on the topic of ‘Colour Music’. Many young people with and without disabilities looked into the relationships between music and art and how sounds from live music can be seen and interpreted into pictures and paintings, and vice versa. In this blog I demonstrate a few ideas of how music and art can work together. Henri Matisse (1869 – 1954) is a French artist famous for his paper-cut outs, collage, space, and colour. I took his style to teach the pupils at Addington School in Woodley the basic elements in music by playing many kinds of percussion and tuned instruments; listening and watching others then deciding on how to translate them into cut out shapes. 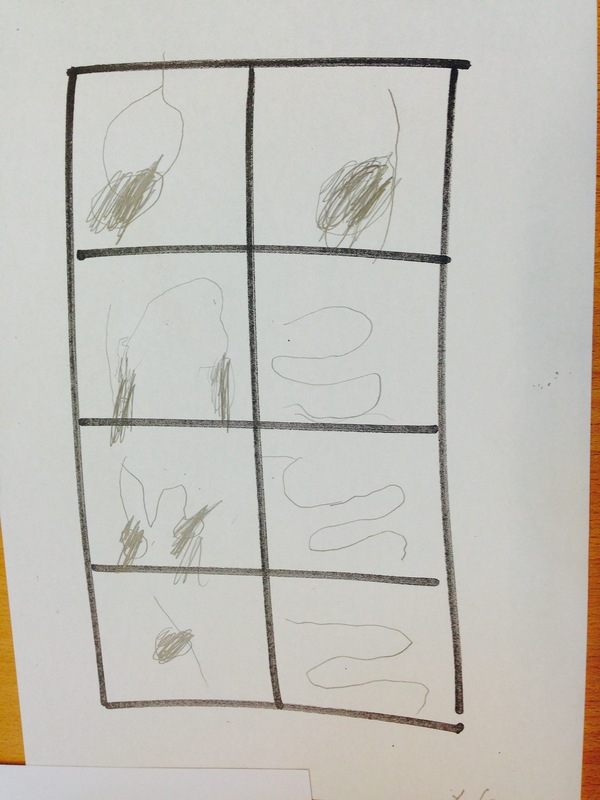 First we looked at individual elements such as fast/slow, loud/soft, shapes, direction, long/short sounds, and tone colours. As I played some tunes on my flute for them to listen to, it was an opportunity to think about 2 or 3 or more elements blending in together to form a full picture. I was pleased to see the outcome; the students at Addington School produced beautiful work. 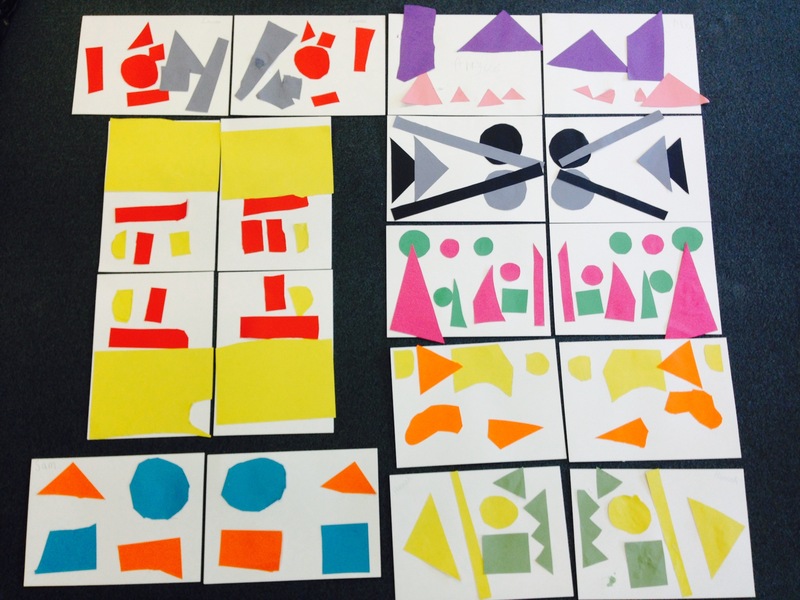 The beauty of the Matisse cut out topic means there are no restrictions when it comes to choosing shapes, colours and collaging. 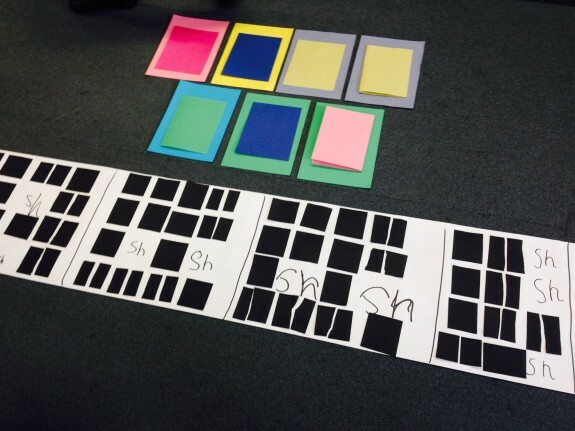 These students have varying levels of special needs but this activity meant they could just allow themselves to be “free” with expression and colour through playing, listening, expressing their thoughts, ideas and making decisions for themselves. 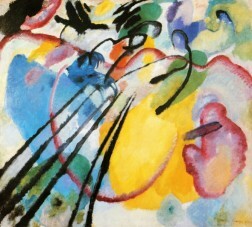 Russian artist Wassily Kandinsky (1866-1944) is considered to be the godfather of abstract art. This type of art has no recognisable subject matter. Instead, Kandinsky tries to convey emotions and feelings through the use of lines, colours, shapes, and texture which are carefully chosen for effect. Music was also going through some major changes in his time such as breaking the traditional rules in compositions and experimenting different with harmonies, unusual sound combinations by many instruments. 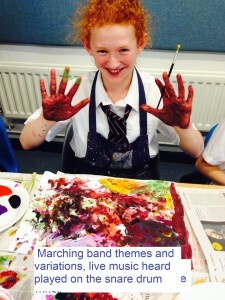 Mary Hare is a boarding school for 200+ severely and profoundly deaf secondary school students in Newbury Berkshire. These students all receive sound through the use of hearing aids and cochlear implants. As Kandinsky’s art was influenced primarily by listening and for the students to get the same level of experience and understanding we took out various percussive and pitched instruments and played through them, making a lot of noise! We worked in groups for sound combinations and relationships, tempo, rhythms, dynamics, and the emotional experience of playing. 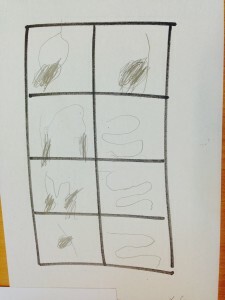 Then they put down their thoughts into drawing and colouring. A video here is a short demonstration. Some of the music I played on the flute, recorder, piano and snare drums were fast, quick, lively, slow, calm, angry, loud, soft and so on – depending on the pieces. 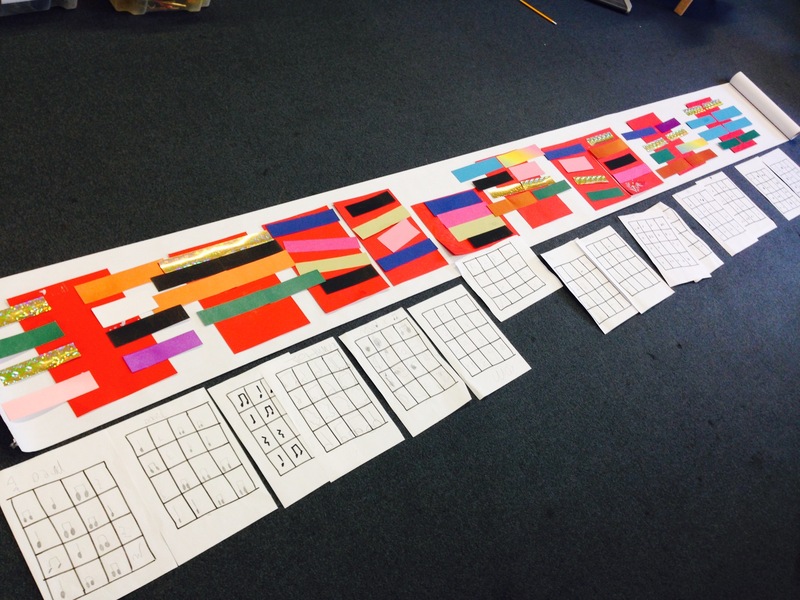 Mary Hare students worked on abstract painting using acrylic painting on a large paper to achieve the same idea. What was important was for them to convey their thoughts, experiences, emotions and feelings through the use of lines, colours, shapes and texture after watching and listening to music, the result was different for each piece, just like it was for Kandinsky. Another group of students at Mary Hare looked into Impressionism. 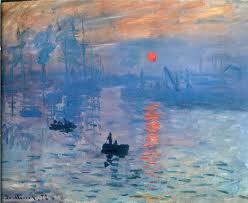 Impressionism is a 19th-century art movement that originated with a group of Paris-based artists. The style of painting is seen as hazy, dreamy, sensual and imaginative. Impressionist artist were more concerned with the light and colour of the moment than with the details of objects they were painting. They often painted outdoors and worked quickly to capture the light before it changed. Artist Claude Monet (1840 – 1926) is known to visit the same view or subject over and over trying to capture different moments in light, colour, and time. The term impressionism is also applied to works of early 20th century composers such as Claude Debussy (1862 – 1918). French composer Debussy rejected the rules of tonality and created music that is pleasing to the ears as impressionist paintings are appealing to the eyes. He used a lot of pentatonic scales and liked the characteristics of music from the Far East – The Gamelan. The Gamelan typically had low sounding instruments moving slowly and higher instruments moving at progressively faster speeds, and a texture that Debussy admired and imitated in his music. 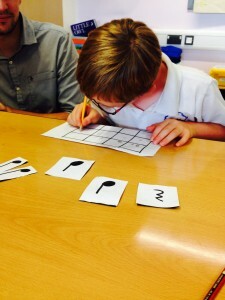 The pupils at Mary Hare studied and composed music using the pentatonic scale. “Penta” means five, as in pentagon. Pentatonic music is made up of five different notes and these five note scales are the basis of many forms of music. They used the 1st, 2nd, 3rd, 5th and 6th notes of the scale – and we usedCDEGA. 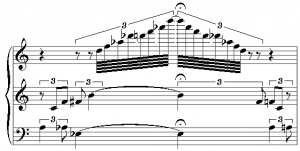 When the students were composing their pieces, it was understood that any pitches of the pentatonic scale can be played in any order without clashing. I brought in hand chimes as they are perfect for playing together with timing, rhythm, turns, and team work. These tall, elegant hand chimes sound like gentle church bells and Mary Hare student’s compositions created sounds that was relaxing, hazy, and almost dreamlike, just like Debussy’s style of ‘cloudy’ music and the paintings of Claude Monet. Geometric Abstract artist Josef Albers is a fantastic example for seeing music as a basic introduction to recognising form in music. Every piece of music has an overall plan or structure, the “big picture”. This is called the ‘form’ of the music. 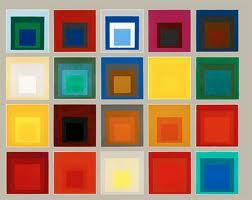 Albers investigated colour theory and composition. He explored mathematical proportions as a way to achieve balance and unity in his art. The students at Addington School learned rhythm work by clapping and with instruments. 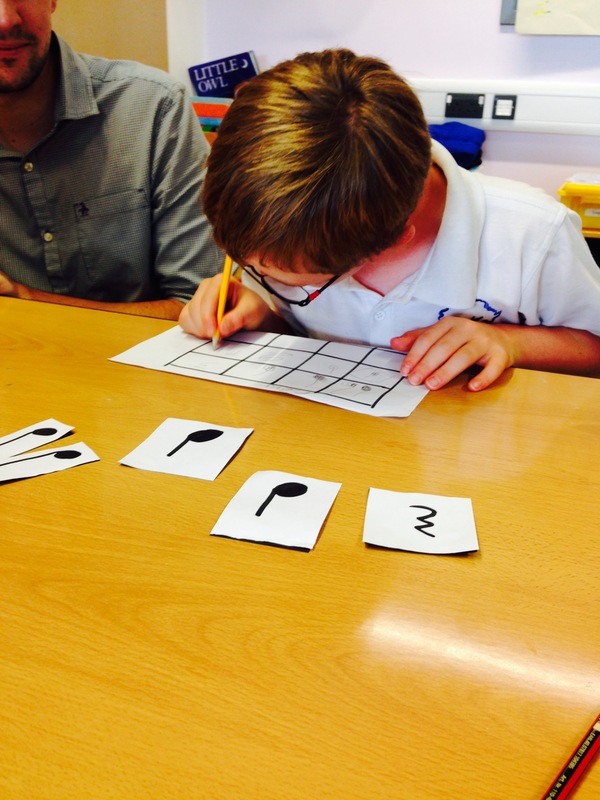 Using my square blocks a method that I have come up with for rhythm teaching, they began to write their own rhythmic ideas independently on worksheet given. From the worksheets which looked like a grid to fill rhythms in, and if one line had the same rhythm as another line they placed matching rectangle bars of the same colour. Otherwise if the tune was something else they placed a strip of a different colour. It was a fun activity and everyone completed fantastic work in no time. After break everyone came up with new rhythms and placed them on a long roll of paper. It was a great group activity and interaction and I asked them to choose two colours that they like best. I told them that these two colours represented their own tune. One of the students copied my rhythms therefore we both shared the same colour squares. 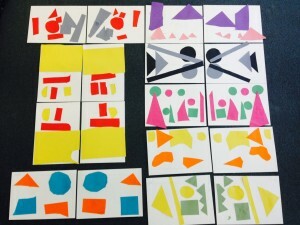 In the end we created what looked like Albers’ ‘Homage to the Square’ series and how these square cut outs explore, connect and separate in many different ways, just like a form of music could be. 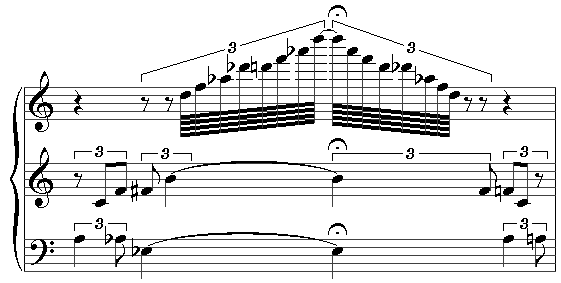 of notes that are played the same forwards and backwards. The same applies in a short melody or tune, particularly with classical composers, Bach and Haydn. 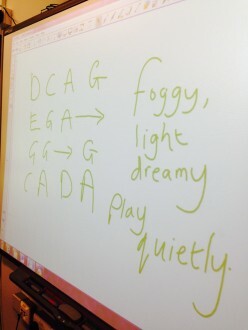 The students made a concentrated effort at playing simple rhythms forwards, then backwards, then vertically up and down. It was fun, but also reminded me that Schoenburg played around with notes using his mirror on score to write them upside down, backwards etc. 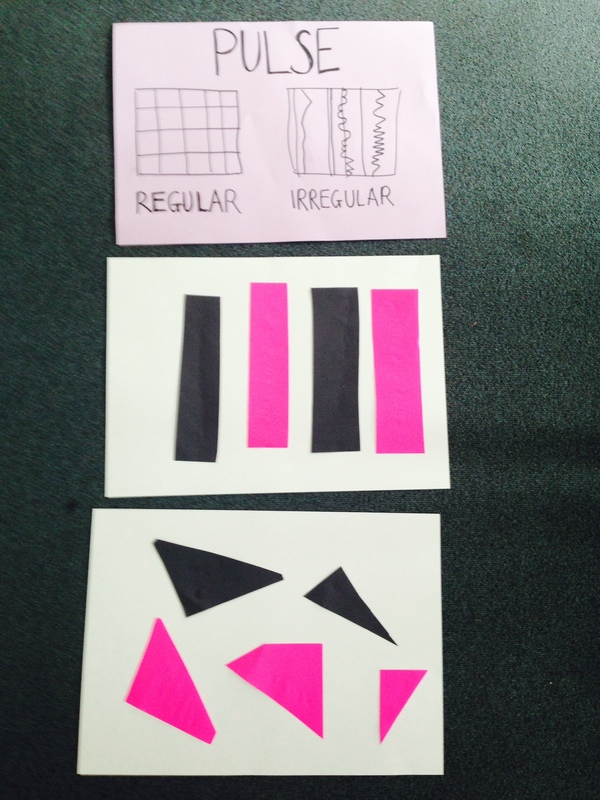 We had a good afternoon of doing cut out symmetries – an idea from musical palindromes. 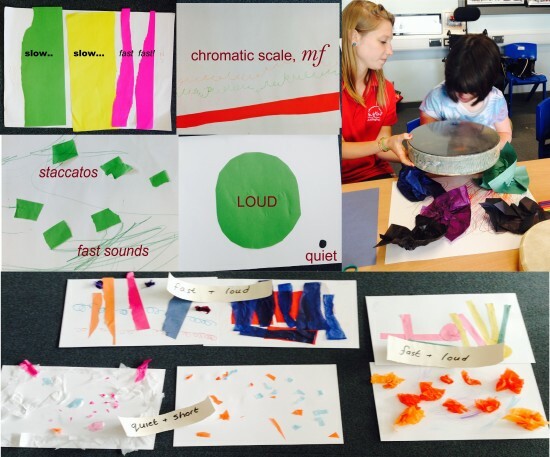 When I was first asked by Decibels if I would like to run the ‘colour music’ workshops I jumped the chance, but I was also worried about how to carry out each session because in my opinion it is such a huge topic! Writing this blog has made me realise how much as a musician I strongly associate my musical experiences with visual imaginary, and carrying out these workshops showed what has been buried deep inside my mind for so long. I think as a deaf person my eyes and my mind enriches my understanding for music as I do not receive them completely naturally like hearing people do. I have really enjoyed it. It was good to do quite a few and various sessions with them, explore various art forms, composers, history timeline and I have been surprised at how quickly students accepted these workshops. I would often forget that they have a hearing problem, or other physical/mental disabilities. Music and art is such a personal thing for the individual, and can play around within their own capabilities when they give things a try. The success of this project has been phenomenal, and I think it goes on to show that music and visual art can blend in very well together and is a highly stimulating and fun activity. Thanks to Decibels for this fabulous opportunity. Generous funding for Colour Music is from the Elizabeth Jane Foundation & the Barbara Saunders Foundation. Please visit http://www.decibels.org.uk/currentprojects.html for more information. Big thanks also goes to teachers and staff at the Mary Hare Grammar School and Addington School for their involvement and support.